Is Baby Oil Good for Your Skin? Baby oil refers to a mild oil made especially for the sensitive skin of babies. Baby oil has been in use for a very long time and has quite a rich history. A lot of debates have been going on since the introduction of this product regarding the side-effects and health benefits of baby oils. Some people assert that baby oil is excellent for moisturizing your body, while others are of the opinion that it is a harmful product and must not be used. 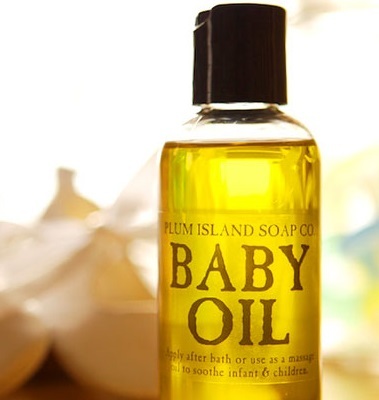 Baby oil is just a simple mineral oil with perfume added to it. Despite all the rumors regarding mineral and baby oil, both are perfectly safe for your skin. Mineral oil has been regulated and controlled by the FDA. In addition, it is purified and refined, which makes it safe to be used on the skin and is a fantastic moisturizer too. Baby oils are used on babies for maintaining their supple skin. However, its use is not limited to babies only. Since baby oil is mild and contains few chemical agents, it is great to be used by adults too. Baby oil can be used for numerous purposes, such as removing makeup and softening the skin without harming it. Now that you know the answer to ‘Is baby oil good for your skin?’ let's move on to discuss some amazing uses. Massage your body with baby oil right after taking a shower to keep it supple, moisturized and hydrated. If you don’t feel like showering often in winters, then mix equal parts of baby oil and water, apply the mixture on your body to keep your skin super soft, smooth, and hydrated. Baby oil can help keep you warm in the chilly winters. Massage your body with baby oil before wearing clothes. The baby oil will seal your skin pores, helping insulate the heat in the body, keeping you cozy and warm. Massaging your body with baby oil is a good way to relax your anxious and stressed nerves. This calms you down, helping you stay relaxed and happy. In addition, it reduces friction between the skin and hands. Use a little baby oil on your arms, legs or beard for softening the hair before shaving them off. This reduces the friction and tingly feeling you experience while shaving, making the process smooth and convenient. If you get pain on your skin while painting the room, or any other thing, then you could easily remove it by applying baby oil on the stained areas of the skin. Wipe the skin dry with a clean paper towel and you can rinse it too. Baby oil can be used for removing makeup. Pour a few drops of it on a cotton ball and gently wipe the makeup off your face. Rinse your hands, face with cold water, and dry the skin using a soft towel. Baby oil removes all of the makeup without harming your skin. Your legs and arms become sticky after you wax them. You can apply the baby oil and water mixture on them for easily removing that stickiness and getting clean skin. You can use baby oil as a gel for reducing puffiness under your eyes. Massage a few drops of baby oil on your fingertips and massage the sensitive area with it for about two minutes. Clean off the extra oil with a tissue paper. Baby oil is excellent for softening chapped lips. Take about a teaspoon of the oil, couple of drips of fresh lemon juice and ½-teaspoon sugar and mix all these three ingredients well. Rub this mixture on the lips very gently for about three to four minutes for making them pink and soft. This mixture is also useful for getting rid of dry and dark elbows. If your heels become cracked in winter or otherwise, you could use baby oil on them for healing them. Make sure to wear socks after applying it, as it will keep the heels soft. In addition, you should apply it on the heels after showering. Baby oil can also be used for removing cuticles from the nails very easily. Massage your fingernails with baby oil while doing a manicure to remove the cuticles. This extremely versatile oil can be used for taming your wild eyebrows. Wet the eyebrow brush you use with the gentle baby oil and tame your eyebrows with it. If you have frizzy hair, then you can use baby oil on them for removing the frizz. Soak fresh tissues in the oil and tame your super frizzy hair with them. Make sure not to use the oil directly on the hair as it can make your hair very greasy. Does Marijuana Help Your Psoriasis?